Charles Joseph Sylvanus "Syl" Apps (1915-98) was a professional hockey player, businessman and politician. Throughout his life, Apps displayed remarkable breadth in his abilities and accomplishments. He was a varsity football star and as a pole vaulter, won two national championships and competed at the 1936 Berlin Olympics. During an extraordinary 10-season hockey career with the Toronto Maple Leafs, Apps was renowned for his skill and impeccable sportsmanship. 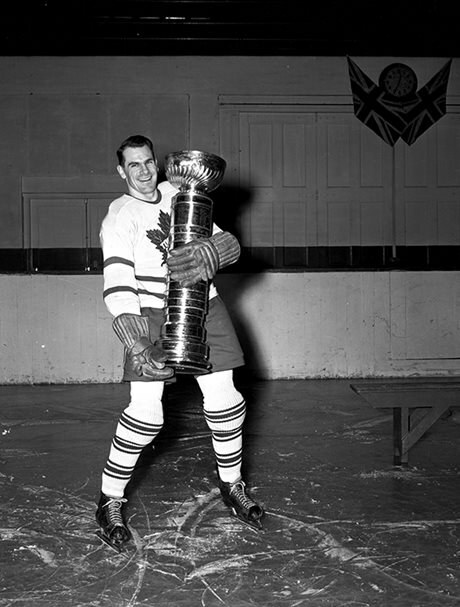 He was the Leafs' captain for six seasons and led them to three Stanley Cups. During the Second World War, Apps left the team for two years to serve in the Canadian Army. After retiring from hockey in 1948, he pursued a successful career in business and was elected to the Legislative Assembly of Ontario for Kingston in 1963 – a seat he held until his retirement in 1974. Apps believed in hard work, respect for others, loyalty, family and faith – and he upheld these values throughout his life. Visit the Ontario Heritage Trust provincial plaque at the Syl Apps Community Centre, at the corner of William and Elm streets in Paris, Ontario. See artifacts on the Hockey Hall of Fame website. Visit Canada’s Sports Hall of Fame for more information on the winners of The Bobbie Rosenfeld and Lionel Conacher Award winners.